As manufacturers of natural latex mattresses and organic bedding, CozyPure has a year-round dedication to earth-friendly practices. Not only do we manufacture GREEN bedding using only renewable and sustainable materials, we are eco-conscious in all of our operating procedures right down to the light bulbs we use in our showroom and workshop. Although we like to think of everyday as a day to celebrate Earth and her renewable resources, we join the rest of Earth’s inhabitants to celebrate “Earth Day” on April 22 each year. CozyPure typically has a sale each year to celebrate Earth Day and of course that is well received! This year we will be doing something new and exciting (in addition to a sale): A fashion show in which contestants will be challenged to use their creativity to design a wearable fashion using only local business scraps and waste, otherwise headed to the landfill. 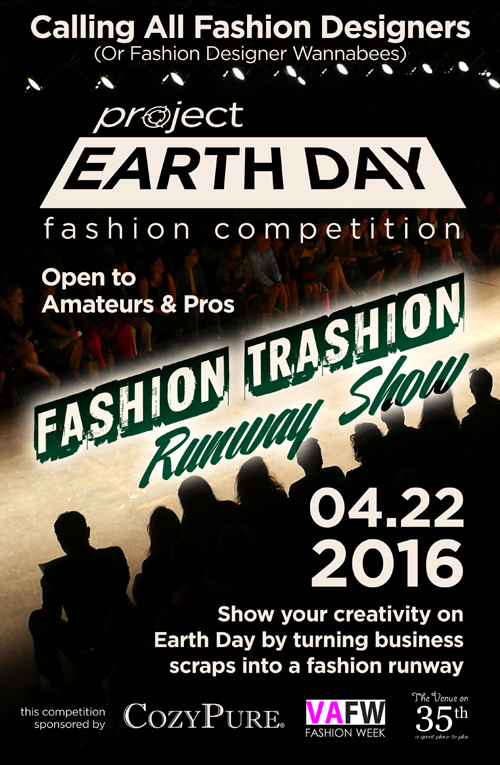 On April 22, 2016, The Venue on 35th in the Park Place District of Norfolk will host Project Earth Day: Fashion Trashion Runway Show. Sponsored by CozyPure, Virginia Fashion Week and The Venue, this fashion competition is open to all ages and levels of experience. This community event seeks to showcase Hampton Roads’ creative talent while participating in environmental stewardship through the demonstration of upcycling – also known as creative reuse, is the process of transforming by-products, waste materials, useless and/or unwanted products into new materials or products of better quality or for better environmental value. Attendees of the event will enjoy a runway show featuring the designs, as well as Earth Day-themed live performances by area talent presented in interims throughout the show. 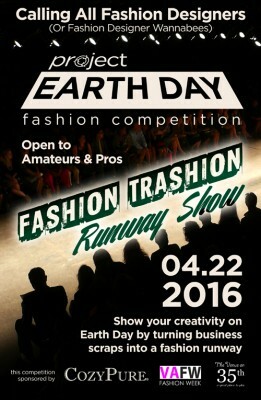 All interested contestants are encouraged to register at http://www.cozypure.com/projectearthday. Spots are limited, first come first serve. The general public is welcome to attend the event on Earth Day, April 22nd at the Venue on 35th located at 631 W 35th Street in Norfolk. Doors open at 6pm. Runway show starts at 7pm. Refreshments will be available for purchase through a local non-profit organization. Contact CozyPure Organic Mattresses and Bedding for more information, 757-480-8500.